Combining fashion with functionality, foldable sun hats are travel essentials you won't want to forget for your trip. Foldable sun hats not only help you become extra stylish but also give your skin and eyes the protection they need against the sun. If you are looking for durable, foldable sun hats to use during your travels, why not try a Shape Flexer headgear product? Our foldable sun hats are created with only high-quality fabrics and materials on the market. Additionally, these foldable sun hats come in four exciting colors to match the style of different customers. Damien Henning, the creator of Shape Flexer foldable sun hats, is a man with a passion for traveling. He has spent copious amounts of time exploring sun-drenched lands and immersing himself in nature. During his trips, he has tried various foldable sun hats to protect himself from the sun's harmful UV rays and beat the summer heat. To his dismay, none of the foldable sun hats he has worn in the past seemed to meet all his needs and expectations. Determined to use a hat that addresses the common and major flaws of protective headgear, Damien created and designed the Shape Flexer foldable sun hats. He then began generating profits from making foldable sun hats upon receiving positive feedback from his fellow adventurers. Our foldable sun hats are waterproof. No matter the weather, expect our foldable sun hats to provide you with the protection you need. Our foldable sun hats may be normally used for blocking sunlight, but they're also designed to keep water off your face. Are you exploring a rainforest with sporadic weather conditions? Do you need foldable sun hats that don't buckle even in torrential downpours? If you answered yes to both, you'll be pleased to learn you no longer have to conduct a fruitless hat search because it ends at Shape Flexer. Made with waterproof materials, our foldable sun hats can help keep your face from getting soaked in the rain and prevent the water from landing straight to your travel pack. Our foldable sun hats feature secret storage. One of the features of the Shape Flexer foldable sun hats that set them apart from others is their secret storage. Inside our foldable sun hats is a secret pocket, where you can store your money, cards, and other valuables. You don't find foldable sun hats with secret and secure storage like that every day. 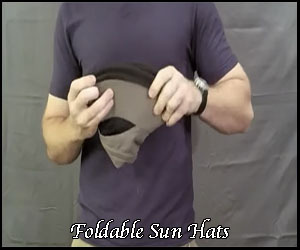 Our foldable sun hats are machine washable. You don't need to wash our foldable sun hats by hand because they are designed to hold their shape through packing, crushing, and machine washing. When the Shape Flexer foldable sun hats get dirty, you can simply pop them in a laundry machine and set the wash to a warm or cold cycle. Our foldable sun hats have an adjustable brim. You may find sun hats with a brim that’s supported by a thin, flimsy wire, but this is not the case with the Shape Flexer hat. Our sun protective hats have a patented and durable wire built into their brim, so you can adjust and fold them to your liking. With an adjustable hat brim, you can easily fold and fit your sun hat into small bags. You’ll also be able to bend the back of your hat for clearance when you’re carrying a large travel pack. Prolonged sun exposure can damage your skin and eyes. Protect yourself from UV rays by wearing the Shape Flexer sun hat! This product is available in four exciting colors. It also has an adjustable cord that lets you loosen, tighten, and fine-tune the size of your hat. Contact us today to learn more. Sun hats are more than just an addition to your outfit. They protect you against harsh UV rays, which is why these products are important for your health. Read on about sun protection hats: http://www.top-travel-tips.com/sun-protection-hat.html. At Shape Flexer, we have the sun hat that can enhance your getup and provide a comfortable barrier against the summer heat. If you are searching for a sun hat with the right features to wear during your travels, look no further than our Shape Flexer sun hat.